Buy 1 DAY ACUVUE TruEye - the world's first silicone hydrogel daily disposable lens that's designed to maintain eye health and reduce redness, dryness and tiredness. City life is exciting but it can be demanding on your eyes, that’s why contact lenses must be worn in a healthy way. ACUVUE® brings you our latest innovation – 1 • DAY ACUVUE® TruEye™ – the world's first silicone hydrogel daily disposable lens. A lens that’s designed to maintain eye health and reduce redness, dryness and tiredness. With the highest UV protection1, HYDRACLEAR®1 technology that works with your eyes’ natural tears for ultra smooth comfort, and almost 100% oxygen delivery2 that lets eyes breathe freely; 1 • DAY ACUVUE® TruEye™ gives you clear, white and healthy eyes. 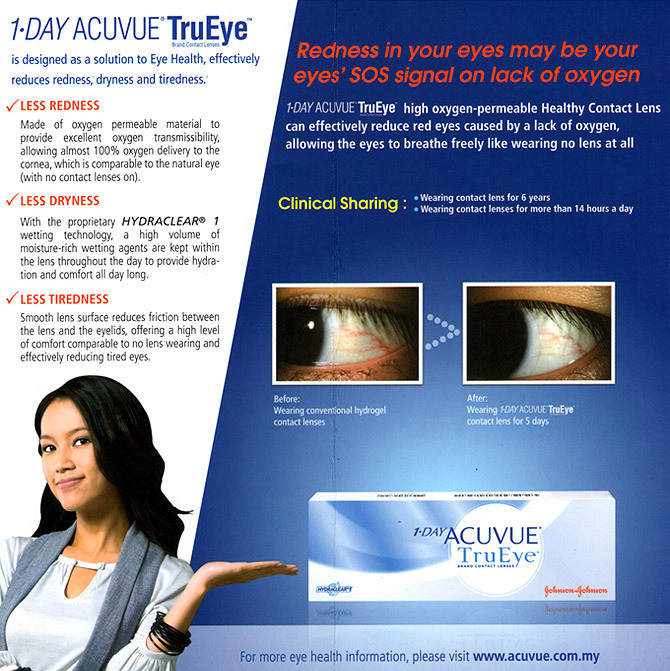 1 • DAY ACUVUE® TruEye™ helps maintain eye health, ridding you of any redness, dryness or tiredness for brighter, whiter eyes.